If you’re new to the world vaping you may be asking yourself, “why would I want to join a vaping community or connect with other vapers?” Getting started may seem like a simple process, but vaping can become an in-depth and time consuming hobby that could eventually turn into an obsession. E-cig technology is constantly evolving and there are literally thousands of products to choose from; so if you’d like to advance your knowledge and have best results possible, you’re bound to have some questions. Interacting with like-minded individuals who share a common interest can not only be educational, but it can also be fun. Fellow vapers are the best source for info and their personal feedback can assist you along the way. There are several ways to connect with other vaping enthusiasts. If you’re more of an introvert, online vaping forums are the best place to start since you can browse and interact with complete anonymity. Setup a profile, search the posts and comment or ask questions whenever necessary. If you’re more of a socialite, you may want to meet with other people (in-person) to connect and share. 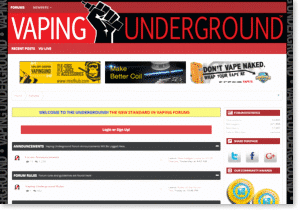 Vaping Underground may not be the largest or most well-known vaping forum (yet), but this relatively new website has quickly attracted members from around the vaping community and it’s my personal choice for top vaping forum. It’s loose format and no-holds-barred attitude about posting is a breath of fresh air for those who are annoyed by the long-list of rules at other vaping forums, such as ECF (below). The website is well-organized, easy to navigate and people are extremely friendly and eager to help – no matter what level of vaping you’ve achieved. With nearly 20,000 members it’s not a small community by any means, but you won’t get overwhelmed by hundreds of comments on every post and (for now) it has a personal feel that you won’t find at some of the bigger vape forums. Vaping Underground has a long-list of sections for every type of vaper and/or product – from beginner to full-blown expert. Unlike some communities such as Reddit (below), you’re unlikely to get shamed for asking a “dumb” question or posting something in the wrong section. Moderators keep things well-organized, and in general the VU community is welcoming to new vapers. ECR boasts more than 85 thousand subscribers and millions of visitors each day. This active e-cigarette community is a subcategory on Reddit that provides a unique and in-depth way to connect with other vapers on practically every subject that relates to vaping. Not necessarily a “vaping forum” per se – it’s actually a message board governed by member ratings. Users posts questions, reviews, comments, images and other content – which is then voted up or down by other members. Browsing ECR can be a bit difficult at first, but if you’re trying to stay up-to-date with the latest industry news or need quick and helpful advice, it’s one of the best communities around. Many of the most experience and knowledgeable vapers use ECR, and vendors often provide contests, giveaways and other special deals. As with any message board / forum, it’s not uncommon for “trolls” to hijack posts with useless or negative comments. Don’t be discouraged! There are plenty of helpful and friendly members on ECR. The key is to search before you post, since members often get annoyed by seeing the same questions over-and-over. If you’re unable to find an answer to your question, feel free to post on the main ECR board, but newbies are more likely to get a positive response on the Vaping101 subreddit. The E-Cigarette Forum, commonly referred to as ECF, began in 2007 and is undoubtedly the largest and most heavily trafficed vaping forum on the Web. 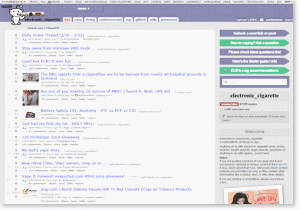 Unlike Reddit, ECF is a traditional database of information broken down into sub-forums (like Vaping Underground) that cover the needs of practically every type of vaper. It has nearly 250,000 members (with 17,000 considered “active”) and is loaded with information, reviews, tutorials and in-depth user feedback. It can be a bit overwhelming sorting through the thousands of different posts; many of them containing numerous pages of comments, but you’ll undoubtedly find the answers you’re looking for if you use the search function at ECF. Feel free to browse, but you’ll need to register to participate, and 10 posts are required to leave the “New Members” section. ECF was my go-to vaping forum for over a year, and I still visit on occasion, but sorting through the vast array of content can certainly be time-consuming. In addition, moderators seem a bit overzealous and regularly delete posts, or even ban users. The forum rules are extensive to say the least, and moderators aren’t always friendly or accommodating. The moral of the story: follow the rules at ECF and be careful what you say or could get scolded – or even banned. What is your favorite vaping forum? Aussie Vapers – Popular vaping forum dedicated to vapers in Australia. Calivapers – Focussed on the California vaping scene. 18,000 members. Nu-Vapor Forum – Moderately active with plenty of information. Planet Of The Vapes Forum – Frequented by thousands of (primarily UK) vapers. The Vaping Forum – Not a huge community, but an active membership base. Vapatron – Clean, well-organized forum with about 7,000 active members. Vapers Forum – Basic vaping forum with a decent amount of activity. Vapor Talk – Active community of dedicated vaping enthusiasts. UK Vapers.org – Popular forum reserved for vapers in the UK. If you’re looking to get fully involved in the vaping community, large vaping conventions and annual vape meets occur regularly across the country. Several big events occur each year, including Vape Bash, Vape Fest, Vaper Con East and West, Vape Expo and ECC, just to name a few. These large conventions are a great place to connect with other vapers, but they’re especially useful if you’d like to stay up-to-date with the latest equipment and market trends, or you enjoy getting a bunch free swag from all the top vendors and e-cigarette manufacturers. You may even run in to some popular vaping celebrities. If you’re annoyed by big events and surfing the Web isn’t your cup of tea, there are a growing number of opportunities to meet locally to discuss, interact and share. Brick-and-mortar vape shops are popping up in cities across the country, so it’s become much easier to find like-minded individuals in your area to discuss vaping and all of the hottest trends. Not only are shop employees an excellent source of info, but small, local groups often meet at community vape shops. Local vape groups are likely to exist right near your home or work; or you could even start your own. Visit or call local stores and ask if they have a lounge or a dedicated space for enthusiasts to meet. Meetings allow vapers to share their knowledge and test out the latest mods, e-juice, tanks and other vaping gear (just be sure to bring your own drip tip). It’s a great way to learn, try new equipment and sample unique e-juice flavors BEFORE you spend your hard earned money. In addition, local vaping groups are particularly helpful to anyone trying to quit smoking. Unlike AA meetings, local vape events offer an interactive and fun experience where you can learn and draw inspiration from others. For many people, support groups are a critical element to successfully kicking tobacco. Plus, local meets are often less commercial and more intimate; held in a variety of places such as vape shops, parks, bars or even someone’s backyard. Some groups even offer activities, such as games and competitions to liven things up. No matter what your level of experience, you have nothing to lose and a whole lot to gain by connecting with other vapers on the Web, or in your area. You’ll make new acquaintances, learn from their experiences, and you may even find out that you enjoy helping others just as much as you enjoyed being helped. Where do you connect with fellow vapers? Please share below! I am a user of all 3! I am a ECF refugee at VU. https://www.planetofthevapes.com/ should be there in the list.